Google/Bing Marketing (Search Engine Marketing) campaigns target users searching for relevant products or services in major search engines such as Google or Bing. Adverts are shown adjacent to relevant search engine results. Display Marketing (Display & Retargeting) campaigns use browser tracking information to target users that have previously searched for your products and services. Banner adverts are displayed on relevant sites as users continue to browse the web. You can narrow your traffic by selecting relevant business categories and target locations, use retargeting tactics to promote your products and services to previous visitors to your website and prospecting features to identify strong business leads. How are Campaign Fees calculated? Campaign fees comprise two elements – your Campaign Budget and the AdGuru Monthly Fee. Campaign Budget – this is the allowance you approve to run your campaigns. This money is sent directly to the search engines/advertising platform on which your campaigns are displayed to secure traffic. AdGuru Monthly Fee – a flat fee charged to cover our services, including consultations, campaign revisions, 24/7 optimization and more. Fees are fixed, but tiered depending on the size of your Campaign Budget, ensuring you have a clear idea of total spend per month. How do I understand my Campaign Status? 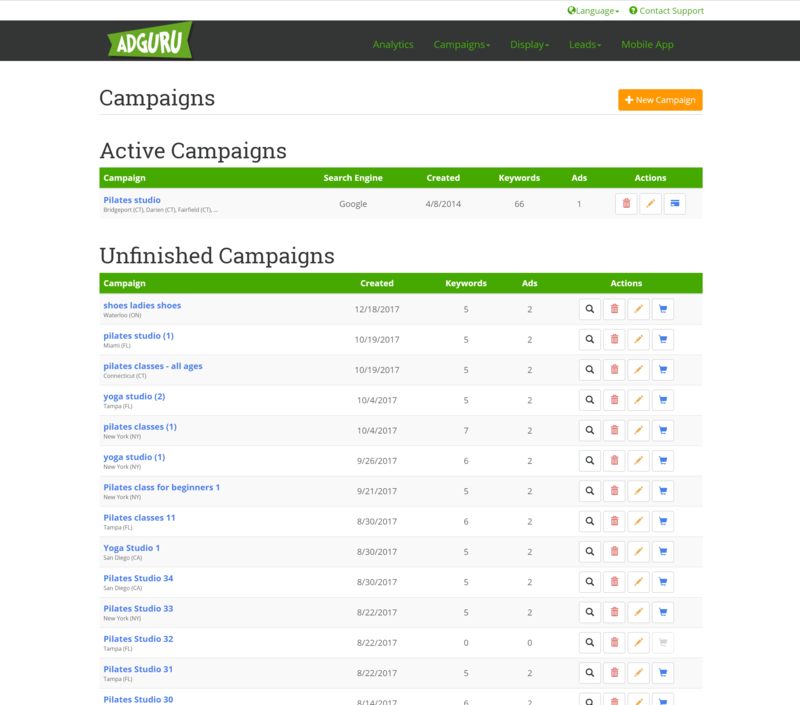 Once you build or purchased a campaign, you can view its status from the AdGuru portal. Select Campaigns > Manage from the top navigation menu. Unfinished: A campaign was created, and is being built. It has not been purchased, nor is it active. Any changes or progress made is saved, so you can resume building at anytime. Active: A campaign was purchased and is live on the selected search engines or display network. Cancelled: The campaign is set to not renew and will run until the end of the current monthly cycle, or until allocated spend is consumed.